Did you ever wonder how busy the servers of the world’s largest social networks are? It turns out it’s very hard work being popular, especially for the number one player. According to data from Google, Facebook serves 260 billion page views per month. That’s more than six million page views per minute, or a staggering 37.4 trillion page views in a year. We can safely assume that Facebook’s web servers aren’t getting bored waiting around for work to do. No wonder Facebook needs as many as 30,000 servers, and they probably keep adding more and more. After all, they’re still growing. If you ever had any doubts that Facebook is king of the hill, at least in terms of sheer site activity, have a look at the chart here below that we put together using data from Google Ad Planner. These are global numbers. Facebook has almost 11 times as many monthly page views as MySpace, which came up second, and 59 times as many as Twitter. In turn, Twitter has more than twice as many monthly page views as LinkedIn. Digg has twice as many monthly page views as Reddit and more than seven times as many as Slashdot. Comparing the first and last on this list, Facebook has 5,778 times as many monthly page views as FriendFeed (which Facebook owns these days anyway). There are of course plenty of other things that can keep servers busy other than serving web pages, for example streaming music or video, third-party data access via APIs (for example Twitter apps), etc. Also, don’t get page views confused with actual visits or user numbers. Having more users makes it more likely that sites have many page views, but there are also other factors to consider, such the site design itself and the type of service it offers. Some sites encourage exploration more than others, clicking around to different pages. We’re going to have a closer look at this in a later post. But for now, let’s just admire the incredible amount of work being done by these sites, every minute and hour of the day. Being popular in social media is hard work. 🙂 No wonder people complain when social network sites have downtime, there are always a ton of people using them. Note: As always when working with estimates (which Google and all other external data collection services do), there will be a margin of error in the numbers. Duh! Myspace is so 2006 and most people access twitter via a client and not the web site. Interesting numbers. I appreciated mentioning the 30,000 servers Facebook has – I hadn’t heard that before. Truly mind-boggling! Facebook has 37.4 trillion page views in a year? Wow! Staggering indeed. This graph shows to me that Twitter is still an infant. I am predicting that Twitter will continue to grow, perhaps faster than Facebook. I will not be surprised if Twitter surpasses hi5 in page views by year end. It’s worth remembering that plenty of Twitter’s traffic is via 3rd party applications, whereas almost all Facebook traffic is on site. You might want to mention YouTube, averaging ONE BILLION views a day. Do the math, 30 days in the month, a billion views a day….. I mention YouTube because YouTube IS a social network too. Run behind the scenes by Google Friend Connect, or so we believe. 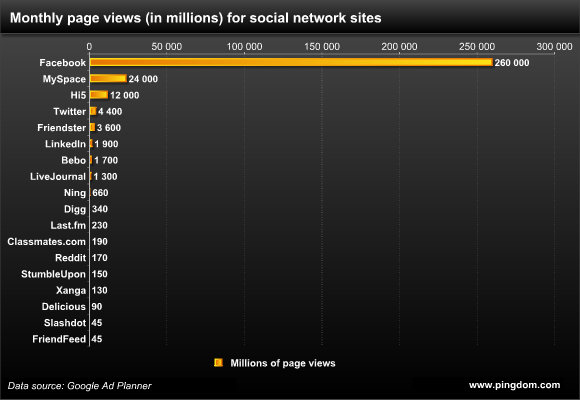 Not to mention YouTube is the #2 search engine, ahead of Yahoo or da Bing. Kinda sheds a whole new light on what Google is really doing with Friend Connect, Google Wave and YouTube. Not to mention 40 other applications like Reader, Maps and Gmail all wired together into one big social network. Kinda makes Facebook puny in comparison. Also let’s do the math here. 260,000,000,000 page views per month. That means in one month every Facebook user has to load 742 Facebook pages per month. Divide that by 30 days in the month and you get EVERY Facebook user loading 24.7 pages per day. 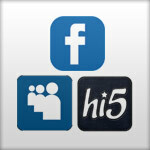 Now let’s say 50% of Facebook profiles are inactive. That is a real number for social media profiles. Now the half that are active have to load 50 pages per day to make those numbers real. If you are spending all your time loading 50 pages a day, how does anything on Facebook have time to convert into sales, newsletter opt ins or connections that bring in consulting, affiliate sales or services? To me these numbers say the average Facebook user is too busy with Facebook to be of any worth to any business on Facebook. These numbers show why we have seen a drop in Facebook conversions for our client’s sites. This is also why Facebook users are not apt to leave the site, or convert into business relationships that some seem to think can come from Facebook profiles and fan pages. Facebook users are too busy to hold a job and make any money to spend on anything else but rent and their Internet connection. Or so these numbers tell us…. for peek times, to me it still seems that there’s something ‘wrong’ in the numbers mentioned above (too low). Am I missing something?? ?